It was one of those typical March days—cold enough to let you know that winter isn’t quite ready to let go, yet with a hint of spring in the air. One of those days when you have no idea what to wear because there is a good chance you could end up either freezing or sweating…or both, all in the matter of less than an hour. I threw a pile of extra fleece on the passenger seat of my old-ish Subaru wagon, just in case. Cup of coffee in hand, I made the half-hour haul down I-99 to Tyrone, PA, where I pulled into the Burger King parking lot to await the arrival of my companions for the day. They arrived one by one, and we all greeted each other with big smiles and enthusiastic whoops of excitement. Our motley group undoubtedly looked out of place in the rural Pennsylvania town, wearing an assortment of colorful fabrics and strange fibers—from spandex leggings and striped socks (my choice for the day) to snow camo and mukluks (sported by my good friend Ruby Becker)—and laughing hysterically at jokes that most people probably wouldn’t even find remotely funny. At promptly 9am, my father, the infamous Stan Kotala, rallied the group and we all piled into two cars. The hour-long ride was characterized by laughter, friendly banter, and a rather long discussion about local beer. After winding through the mountains past dilapidated houses, wind turbines, and Curwensville Lake, we arrived at our destination—Bilger’s Rocks. After a short introduction, our host, a woman from the Bilgers Rocks Association, finally led us down to the attraction that we had come here for—a “rock city” covering some 20 acres. It was even more impressive than I had imagined. 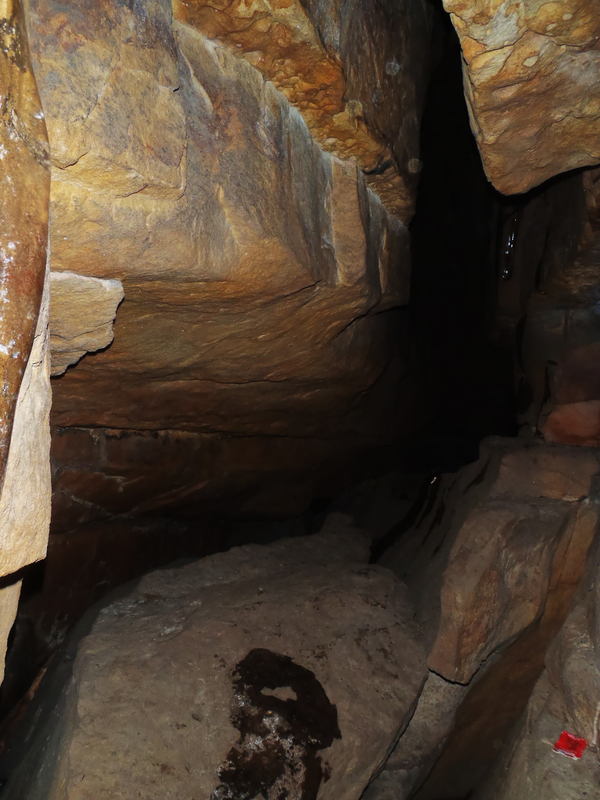 There were a seemingly endless number of passages, caves, and crawl spaces winding between the giant sandstone towers. 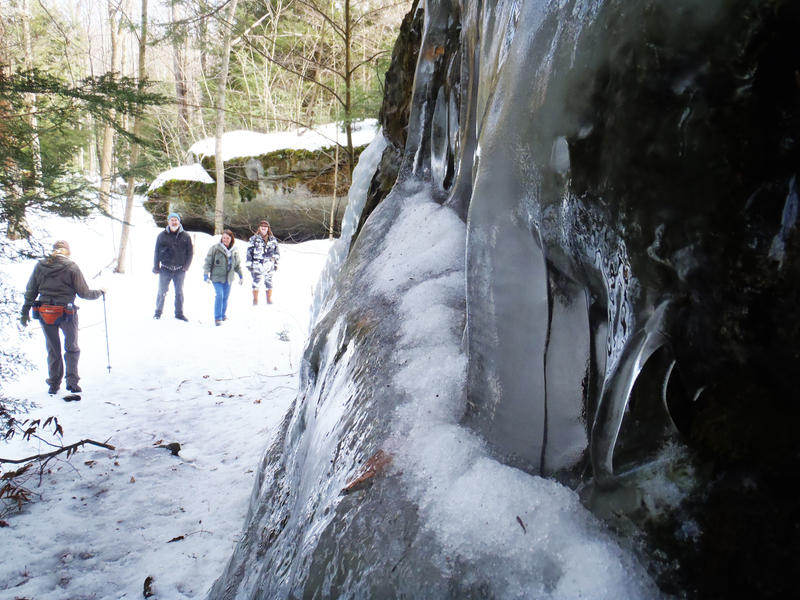 As the rest of the group stared at carvings of an earth, a lady’s face, and other assorted pictures that were chiseled into one of the stone walls, I impatiently began clamoring over the icy boulders, like a kid in a 300-million-year-old natural playground. Our group oooh-ed and ahhh-ed at the occasional sunshine glinting off the ice and moss on the sandstone walls as we squeezed through seemingly-endless tiny passageways. A few of us at a time squirmed our way to a “room” known as the Devil’s Kitchen, while others found their way to the top of the formation and greeted us from above. 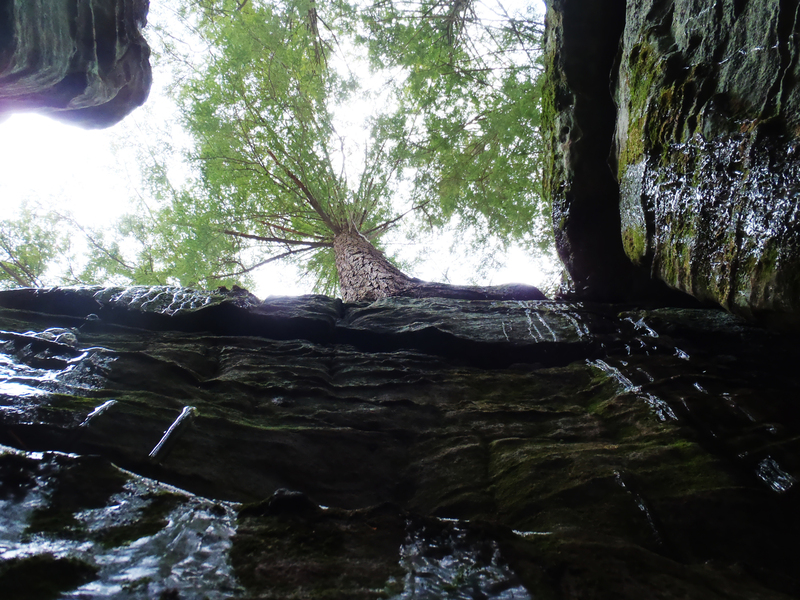 Trees grew out of some of the cracks in the rock, reaching to the sky amid the cold stone. In a crevice, looking up. Kristin Joivell, Dave Payne, and I took a detour from the well-traveled passageways to explore some of the smaller, more obscure ones. Everywhere I turned, there was another crack to explore, more sights to be seen, more curiosities about what lay on the other side. But, we had a group to get back to. A group who was standing around looking at a rock face that just begged to be climbed, with many small, yet perfect, handholds. My reputation as an adventurous spirit preceded me, and as I approached the group, I heard them already talking about how I should climb it. But, before I could make it more than a few feet off the ground, I failed to find any holds that weren’t covered in a thin layer of ice. Climbing was to be left for another time. Just when I thought we had explored the extent of the rocks, we learned that there were, indeed, even more. 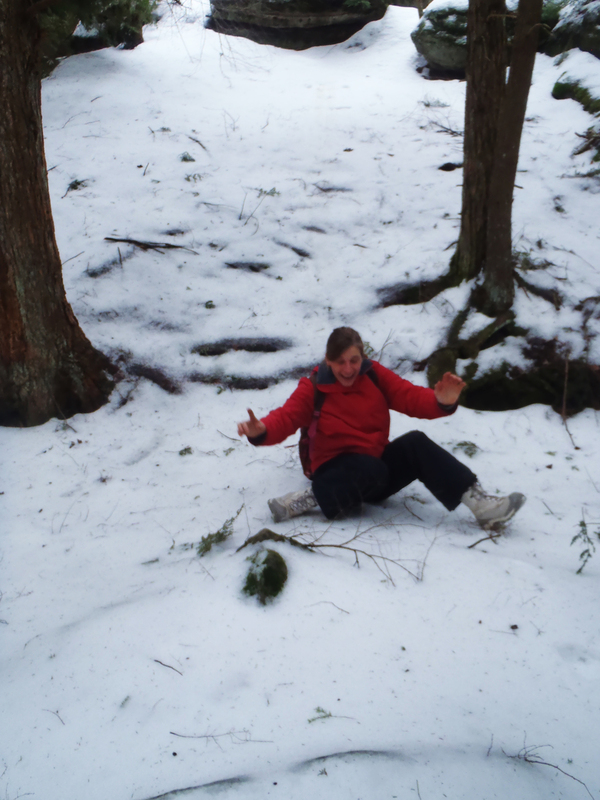 The adventure continued down an icy slope that many of us chose to slide down on the seat of our pants. Dave Hunter got his video camera out to capture any exciting moments that may have ensued. Dave Payne and I found a great ledge to hang off of, providing much amusement and photo opportunities for all the onlookers, and much fun for us. A few of us detoured to a little stream, where we engaged in a very strange conversation about pond scum and decomposing bodies before strolling back up the hill to the parking lot. Kristin was the only one who was truly prepared, first with the head lamp, and then with the snow pants—perfect for sliding down snowy hills. After loitering (and pontificating) in the parking lot with hot chocolate for a while, our group followed tradition and trooped off to the nearest good pub—Denny’s Beer Barrel Pub in Clearfield, PA. The online menu boasted a long list of craft beer, so the beer snob contingent (myself included) was undoubtedly excited to try some new brews. The lobby of the restaurant was lined with photos of customers who had completed one of the “Burger Challenges”—which consists of eating an absurdly large hamburger (either two, fifteen, or twenty-five pounds of meat!) in a particular time limit. A lot of laughs, a delicious bison burger (NOT the 15-pounder! ), and a surprisingly-pleasant chocolate peanut butter stout later, we were once again piled in the Ram Charger, cruising along the country roads back to Tyrone. But the day was not over yet, not without a detour to stop at “Bloody Knox,” a historic Civil War-era cabin along Rt. 453 near Kellytown, PA. By late afternoon, the ground had warmed and the spring-like air once again gave us all the energy of children, frolicking in the fields of the cabin before plopping down on the dry grass to bask in the sun that was peeking out from behind a thin layer of clouds. 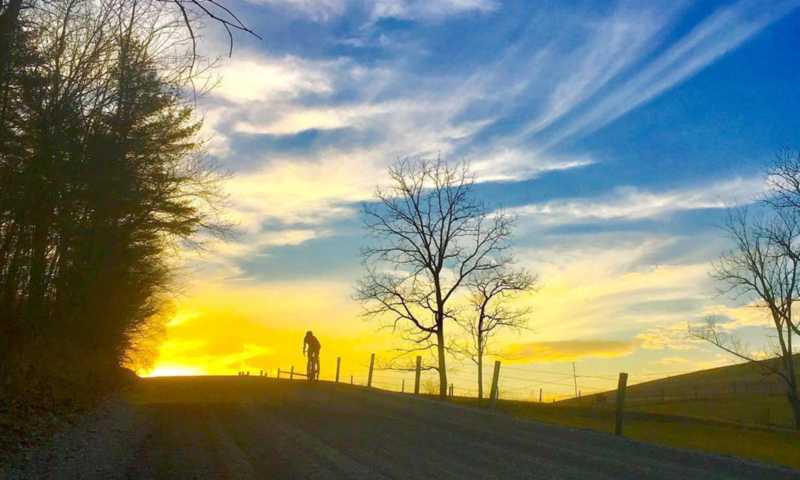 Thanks to daylight savings time, I got to drive home with the angled rays of the setting sun instead of in darkness, yet another reminder that spring is on its way, and with it, many more adventures in the great outdoors. Heroic Helena – Explorer Extraordinaire and delightful diarist. 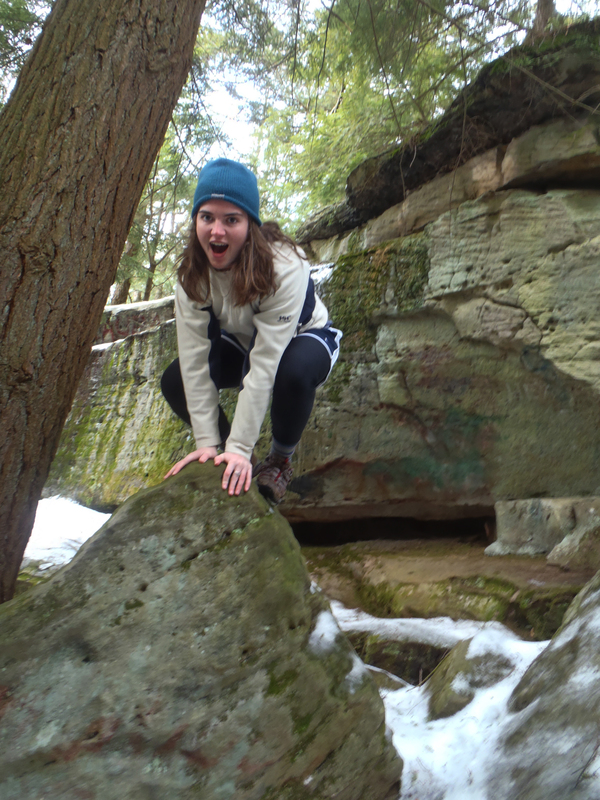 It’s exciting to join groups that come to the rocks to explore what is one of Nature’s coolest gifts to our area. 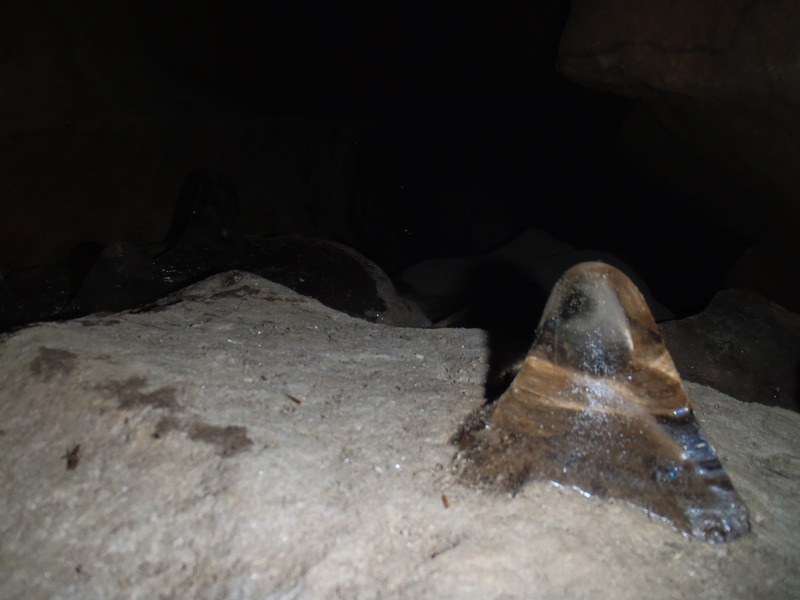 As visitors voice their thoughts and views about these rocks, caves and crevices, I feel refreshed with new perspectives on these ancient wonders and enticed to walk through them once again. Previous PostPrevious The Runner’s High. Next PostNext Running with the boys.